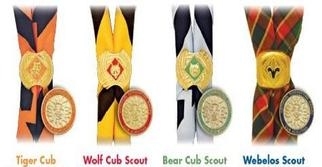 This is a guide for the basic pieces of insignia worn by all ranks on the official Cub Scout uniform. Check for proper placement on the Patch placement guide. The CSP is worn by all Scouts directly below the shoulder seam on the left sleeve. This emblem is unique to each local BSA council. A white numeral embroidered on red background. Worn by all boys and pack leaders directly below CSP on the left sleeve. When the veteran unit bar is worn, the Unit Numerals are worn just below, and touching it. The World Crest emblem should be worn by all youth and adult leaders. The 1-1/2" diameter badge is white on a violet background. It contains a basic fleur motif encircled by a rope tied with a reef or square knot symbolizing the unity and brotherhood of the World Organization of Scouting Movement (WOSM) throughout the world. The emblem should be worn centered horizontally above the left pocket, and placed vertically between the left shoulder seam and the top of the pocket. Contact the Cubmaster for more details. Wearing uniforms has been a method of the Scouting movement from the beginning. Decades of experience show uniforming to have many benefits, including: Equality, identification, achievement, and commitment. For these reasons, among others, all parents should emphasize to their Scouts the importance of wearing the correct and complete uniform on all suitable occasions.